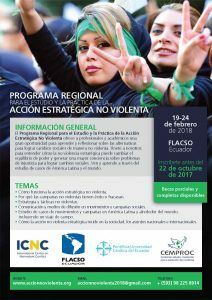 Regional program for the study and practice of nonviolent strategic action. 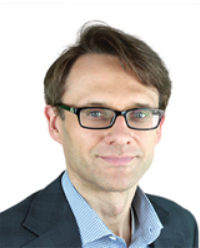 Hardy Merriman is President of the International Center on Nonviolent Conflict (ICNC). He has worked in the field of civil resistance for 16 years, presenting at workshops for activists and organizers around the world; speaking widely about civil resistance movements with academics, journalists, and members of international organizations; and developing resources for practitioners and scholars. His writings have been translated into numerous languages. In 2016 he was appointed an adjunct lecturer at the Fletcher School of Law and Diplomacy (Tufts University). Mr. Merriman has contributed to the books Is Authoritarianism Staging a Comeback? (2015), Civilian Jihad: Nonviolent Struggle, Democratization, and Governance in the Middle East (2010), and Waging Nonviolent Struggle: 20th Century Practice and 21st Century Potential. He has also written about the role of nonviolent action in countering terrorism and co-authored A Guide to Effective Nonviolent Struggle, a training curriculum for activists. For a full publication list, see here. He has worked with the International Center on Nonviolent Conflict since 2005, and prior to that with the Albert Einstein Institution from 2002. In addition to his international work with activists, Mr. Merriman was a Senior Advisor to the 2017 James Lawson Institute, and previously served as the Institute’s Director in 2013 and 2014, organizing two eight-day intensive programs for North American organizers and activists. His work with academics and members of civil society includes presenting on diverse topics related to nonviolent civil resistance at venues such as the Cambridge University (UK), the Community of Democracies Secretariat (Poland), the Fletcher School of Law and Diplomacy (Tufts University), Harvard University, Middlebury College, Monterey Institute for International Studies, Oberlin College, Peace Research Institute of Oslo (PRIO), Stanford University, Swarthmore College, the United States Institute of Peace (USIP), University of Sarajevo (Bosnia), University of Sydney (Australia), Wesleyan University, and many other venues. He is a graduate of Oberlin College. Alfonso “Poncho” Hernández is an activist, popular educator, community cultural manager and documentary filmmaker, originally from Mexico City. He holds an undergraduate degree in Philosophy from UNAM, and a Master’s degree in Anthropological Sciences from UAM-I, where he is currently pursuing a doctorate in Anthropology. He has completed international diploma courses on the culture of peace and nonviolence in the Gujarath Vidyapith-India, the Summer Institute for the Study of Strategic Nonviolence, Tufts University-USA and in the ICNC training program called the Learning Initiatives Network. He has produced a documentary feature film entitled The Art of Peace and other videos about social struggles or violence in Mexico. He has published articles about violence and peacebuilding processes in Mexico. As a trainer, he has coordinated and organized a large number of courses on the culture of peace and nonviolence, both in Mexico City, as well as in various parts of the country and abroad. He has been a speaker and facilitator in several international congresses and meetings for young people, as well as a workshop leader at a large number of events. Likewise, he has initiated the creation of a Latin American Network of Young Peacemakers, in association with various social organizations and universities. He has founded several projects, which operate from the association that he currently runs, Global Unity Sumak Kausay, which operates various environmental, cultural, educational and community projects. These projects are based on participatory methodologies, through different methods of nonviolent action, civil disobedience and constructive program. His specialty is in community work in areas of high violence in Mexico, prevention of violence in urban neighborhoods, workshops with youth gangs and artistic movements that intervene in these contexts. Cécile Mouly is a research professor at FLACSO Ecuador and a member of the Academic Council of ICNC. In FLACSO Ecuador she coordinates the research group on peace and conflict; she teaches postgraduate courses on peace and conflict studies, and human rights; and she conducts research on peacebuilding, civil resistance and the reintegration of former combatants to civilian life. She holds a Ph.D. in International Studies from the University of Cambridge and has several academic publications on experiences of civil resistance in contexts of armed conflicts. 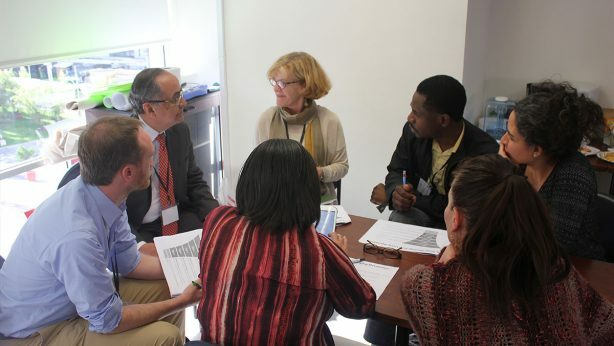 She has practical experience in the field of conflict transformation, peacebuilding and conflict prevention, as a former staff member and consultant of the United Nations, the OAS, The Carter Center and other organizations in various countries. She has facilitated training workshops on different topics related to peace and conflict. Iria Puyosa is a researcher and consultant in political communication, digital strategies and civil society participation. She has ten years of consulting experience for political organizations, NGOs and international organizations, developing social media strategies and building digital communities. She led projects in election monitoring, natural disasters mapping, and digital rights monitoring in Venezuela. She took part in Internet Prioritaria, the first advocacy campaign for defending internet users´ rights from restrictive government policies in Latin America, and, also, the first Latin American social media campaign that was a worldwide trending topic in Twitter (2009). She developed social media strategies for the Venezuelan College Faculty Federation. For several years, she taught workshops and seminars for social media campaigns with human rights focus to civil society organizations in Venezuela. In recent years, she has been active in internet governance forums advocating for online freedom of speech and presenting data-driven research on internet disruptions in Venezuela. Currently, Puyosa works with Huaira, an Ecuadorian organization focused on digital security, online freedom, and internet policies. Current research projects focus on civil resistance, networked social movements, and online propaganda. Experienced in postgraduate teaching at universities in Venezuela, Ecuador, and Colombia, she has taught the subjects of ICTs & Political Processes, Media & Politics, Public Opinion & Social Media, Political Communication, Social Networks Analysis, Strategic Communication and Grassroots Mobilization. She was the team leader in the NewsFrames Initiative at Global Voices. She holds a PhD from the University of Michigan, and also has graduate training in survey-based research (University of Michigan) and strategic communication (Universidad Catolica Andrés Bello). Nonviolent civil resistance movements – which use actions such as strikes, protests, boycotts and many more tactics – are a powerful way to achieve political, social and economic changes. However, they are not understood as well and receive little attention in schools, universities and the media. This session will define the fundamental terms in the field, such as those of “civil resistance” and “movement”, provide examples of nonviolent movements and explain how these movements can exercise power. In this session, we will discuss the key findings of research on the effectiveness of non-violent movements, including their historical and more recent success rates in challenging oppressive regimes. We will also talk about the basic dynamics that sustain the struggles of civil resistance, including the key attributes of successful nonviolent campaigns. In this session we will highlight different theoretical perspectives on how people rise up and movements arise, discussing the role of conditions and abilities in the emergence of a movement. We will show different strategies and useful tactics to awaken and sustain a movement. We will also discuss the different roles that people can play in the movements and the various stages of the movement’s development. In this session we introduced the three sessions on areas of application of nonviolent action in Latin America and the Caribbean and analyzed three case studies. The first two focus on nonviolent struggles against authoritarian tendencies and the third in nonviolent struggle against violence. After a brief presentation of each case, we will make a collective analysis of the movement / campaign and its results. Nonviolent civil resistance involves skills and strategies. This session will provide a general framework to analyze the strategy of the movement, explain the diversity of nonviolent methods available and explain some key factors that can contribute to the efficiency of various tactics. 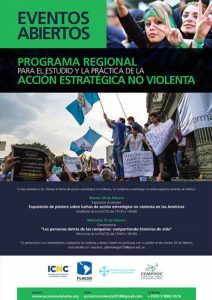 We will also review several cases of nonviolent civil resistance, with a particular emphasis on understanding the impact of the selected strategies. In this session the participants will watch a 30-minute documentary “A Force More Powerful”. After the screening, they will be divided into small groups and will have to answer several questions about the chapter in relation to the discussion on strategic planning and tactical innovation, as well as sequencing as part of a civil resistance campaign. Subsequently, the participants will meet in plenary to inform others about the main issues addressed in groups and participate in other discussions on the specific aspects of the campaign presented in the documentary. Based on a reflection on current violence in Mexico, this session will address the main characteristics of social movements against violence, showing their origins, the strategies they employ and the way in which they have used nonviolent means of struggle and actions strategies of civil disobedience. They will be analyzed critically in terms of their impact on reducing violence and achieving the objectives that are proposed. The cases of the Movement for Peace with Justice and Dignity will be shown, artists in Cd. Juárez denouncing femicide, community projects in violent neighborhoods and the case of the Zapatista Army of National Liberation. In this session we first covered two case studies of nonviolent struggles against environmental threats and then a case of nonviolent struggle for rights. After a brief presentation of each case, we will make a collective analysis of the movement / campaign and its results. In this session, we will first discuss how movements can handle repression, including trying to avoid repression, stop repression, reduce the impact of repression or make repression counterproductive. We will then highlight the key findings of the research on nonviolent discipline, the consequences of the lack of it, and talk about how movements can remain firmly nonviolent. We will also present a conflict analysis tool that helps the movements map their battlefields and induce loyalty changes among their opponents’ allies. It is a workshop that will provide an approach to communication and its importance in civil disobedience movements. Practical activities will be carried out to generate communication processes between groups and a special emphasis will be placed on the development of injustice frameworks, with which the participants will be able to develop this methodology and apply it in their own reality. Likewise, some examples of the use of the media and the new technologies for nonviolent action will be shown. In this session, we will describe various educational initiatives, either in the classroom, conducted by workshops or online, in the field of civil resistance and we will discuss its role, content, pedagogical value and impact. Examples of selected educational programs of ICNC will also be presented.